Here at Bakersfield plastic surgeon Vip Dev’s Sillect Avenue office, Drs. Dev, Ashjian and Rosenberg are committed to your safety, success and satisfaction in cosmetic and reconstructive surgery. 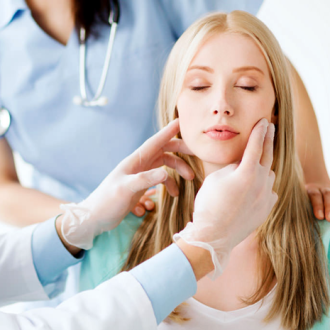 Our plastic surgery practice encompasses northern, central and southern California. Many of our patients travel from out of state to meet with the California Institute of Cosmetic and Reconstructive Surgery, where our staff will help you feel safe and comfortable. All three of our surgeons welcome the opportunity to address your concerns and answer all the questions you have about plastic surgery. When you walk through our doors, a friendly team of medical professionals will greet you, eager to assist your needs and help you feel at home. With great attention to patient care, and extensive training in both reconstructive and cosmetic plastic surgery, Drs. Dev and Ashjian are highly regarded among peers and patients. They are routinely selected as “Best Of” in the Bakersfield area. The California Institute of Cosmetic and Reconstructive Surgery offers all aesthetic surgery options including nose reshaping (nose job), face lifts, liposuction, abdominoplasty (tummy tuck), breast reconstruction, augmentation, lift, and reduction, as well as botox, laser hair removal, skin products & treatments, and even a weight loss program! To meet with one of our Bakersfield plastic surgeons for a private, consultation, just call our Bakersfield office at 661-327-2101 to make an appointment. Consultations are complimentary.When you call, ask us about our financing options so you can Budget Your Beauty.